Our successes helping patients with Alzheimer's disease and their caretakers is thanks entirely to people like you. When you click and view sponsor ads, purchase from our store, or make a direct donation to one of the many wonderful programs we highlight and support, you produce results like these. Thank you for your support in the fight against Alzheimer's disease! The Alzheimer's Foundation of America's National Toll Free Helpline continues to receive thousands of calls from caregivers across the country in need of counseling, programs, service and resources. The Helpline expanded its hours last year to address the increase of calls in the evening. With expanded hours, caregivers across the country have better access to counselling services. Who calls the helpline, and how can a phone call help them? Hundreds of caregivers at their wits' end, balancing full-time jobs and care for a loved one, call for information, references, and help. Caregivers like Leonard. Leonard's mother has Alzheimer's disease, and lives alone in her apartment. On one occasion, she wandered off in the middle of the day, and was later found by local police officers and taken to the neighborhood precinct. Just two months later, she forgot to turn the stove burner off, and set fire to the kitchen. These incidents were frightening, and Leonard knew she needed help. In the United States, alzheimer's disease puts an incredible burden not only on patients, but also on their caregivers. Constant care and supervision becomes necessary, and help with everyday tasks including meals, bathing, and more. Though there are programs that can help caregivers, accessing them requires research, time, and money - and caregivers can't afford to quit paying jobs to devote themselves to full-time care for loved ones. People like Leonard don't always know where to turn. But somehow, Leonard heard about the AFA's helpline. After multiple calls, including one late in the evening made possible by newly expanded helpline hours, the hotline's licensed and dementia-certified social worker was able to get him concrete help. They obtained an in-home aide and companion for his mother, ensuring her safety and getting her the help she needed to navigate the house. Leonard and his mother were also referred to an adult day social program that would help her stay engaged and occupied during the day. Do more to help the Alzheimer's Foundation of America's National Toll Free Helpline, and other programs supported by GreaterGood and The Alzheimer's Site! One of the greatest challenges caregivers of Alzheimer's patients face is accepting the fact that their loved one can no longer take care of his or her own needs. The realization can be overwhelming, and with 5.5 million people living with Alzheimer's disease in America today, the need for support is greater than ever. ExtraCare focuses on providing in-person support for patients and peace of mind for caregivers. How do these programs make a real difference? Patients need an opportunity to engage in structured social activities; meanwhile caregivers need time to rest and meet their own needs. Alzheimer's disease and related dementia conditions worsen over time. Family members eventually need professional outside care for their loved ones as their diseases become less manageable. But not all families can afford to hire a caregiver, and families that do have a caregiver tend to rely heavily on their assistance, and those caregivers rarely get any rest from their jobs. ExtraCare provides opportunities for social, physical, mental, and creative activities for individuals with Alzheimer's disease. A variety of activities are offered daily, and programs are customized to individually meet a guestís abilities. 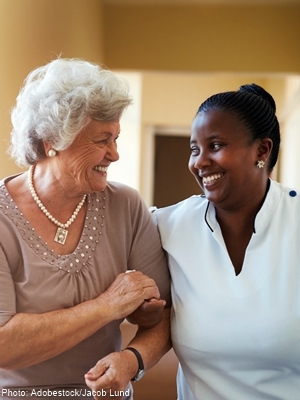 These programs provide some much-needed rest for extremely dedicated caregivers, while offering affordable care and mental stimulation for those affected by Alzheimer's. Activities are wide-ranged and aimed for everyone to have fun and participate, including light exercise. 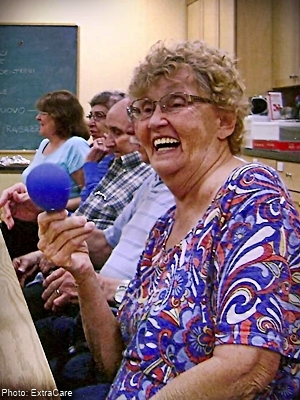 Having fun is a huge part; it gives these individuals something to look forward to while their caregivers get a much needed break from their caring responsibilities. Do more to help ExtraCare for Families Living with Alzheimer's, and other programs supported by GreaterGood and The Alzheimer's Site!